Organizations seeking LEED certification for their construction projects have many ways to earn it, including by using regional materials. 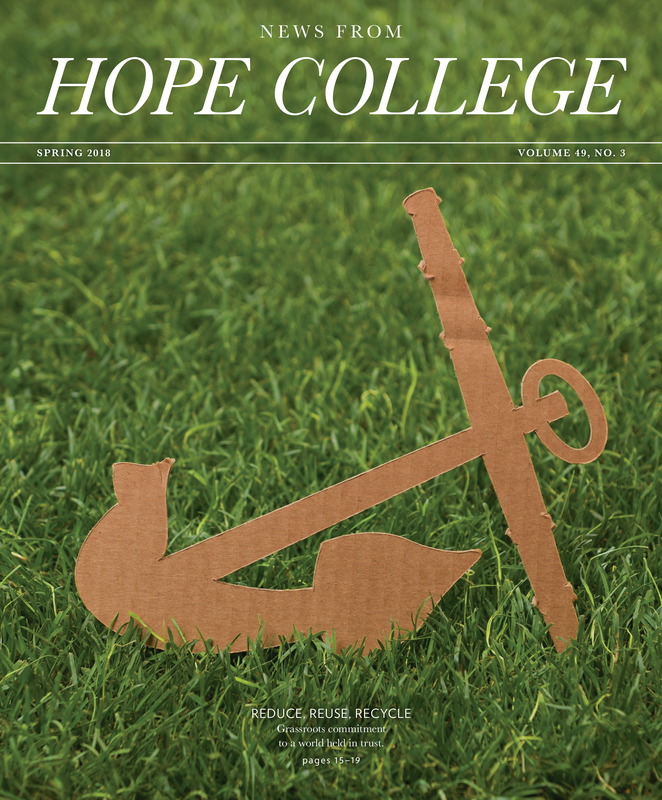 In developing the Jim and Martie Bultman Student Center, which recently received LEED Gold certification, Hope integrated a meaningful resource from mere yards away: wood saved from venerable campus elms felled by a storm. 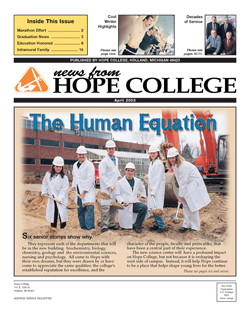 The trees were lost in June 2011 when strong winds caused damage throughout the area. 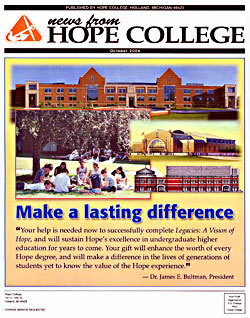 Hope kept them for use some day in a way that commemorated their long tenure at the college. 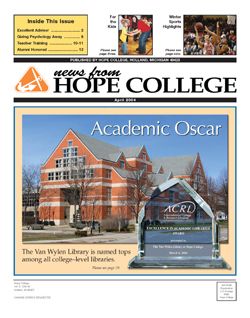 The student center, which opened in 2017, provided the opportunity. 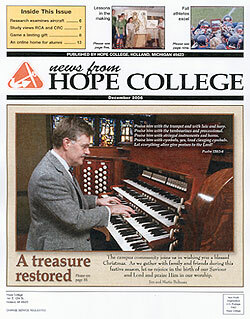 Boards from an elm estimated to have been 164 years old panel the east wall of its Harvey Chapel. 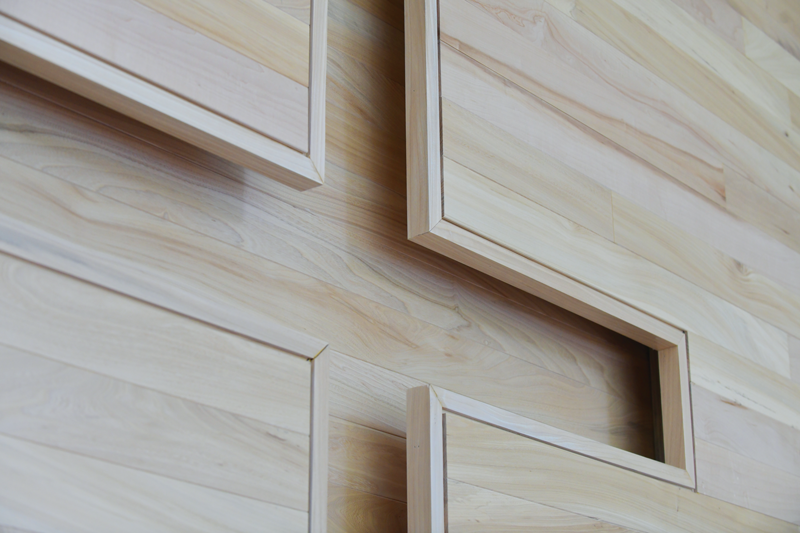 Other walls and a bench also feature wood from campus. 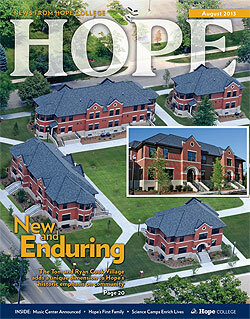 The center is the second new building in a row to earn LEED certification, with plans underway for a hat trick. 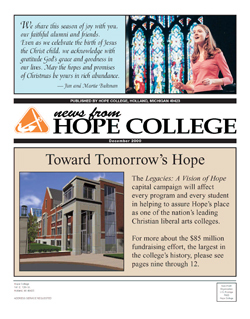 The Jack H. Miller Center for Musical Arts, opened in 2015, holds LEED Silver certification, and Hope will also be seeking certification for the new Campus Ministries building currently under construction. 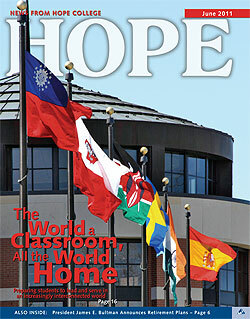 The teacher-education program at Hope has continued its history of ranking as one of the state’s best, placing second in the 2018 Educator Preparation Institution Performance Score report of Michigan’s Department of Education. 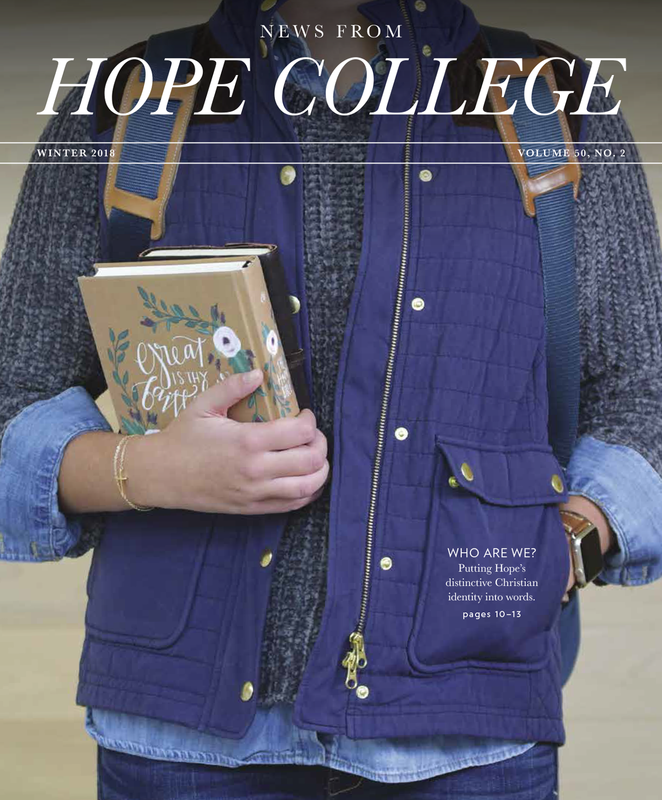 The college’s program prepares students to teach in elementary and secondary schools, with content emphases in a wide range of departments in addition to providing training in special education and early childhood education. 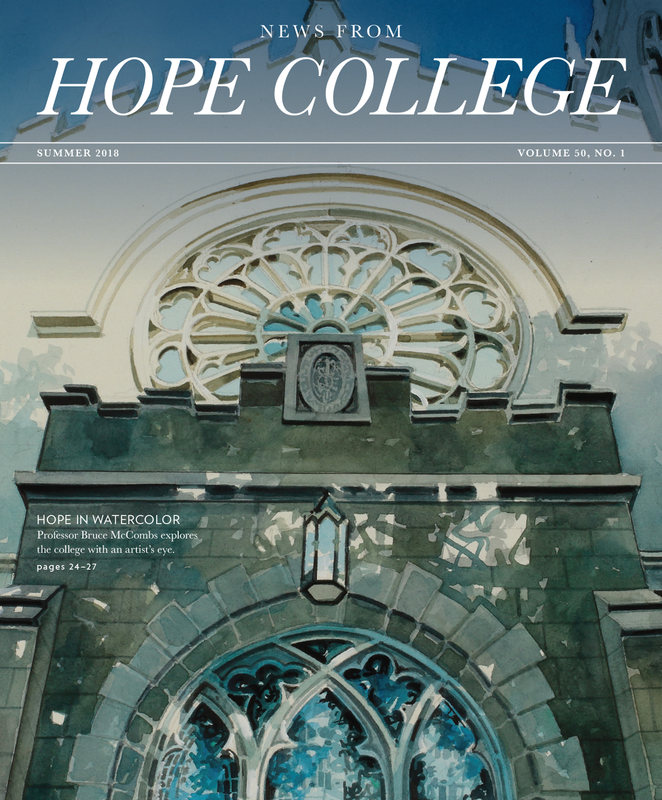 Of the 32 programs in the report, the only institution ranked higher than Hope is a small program that focuses exclusively on art education in the visual arts — and gained its authorization to certify teachers while working under the tutelage of Hope’s department. 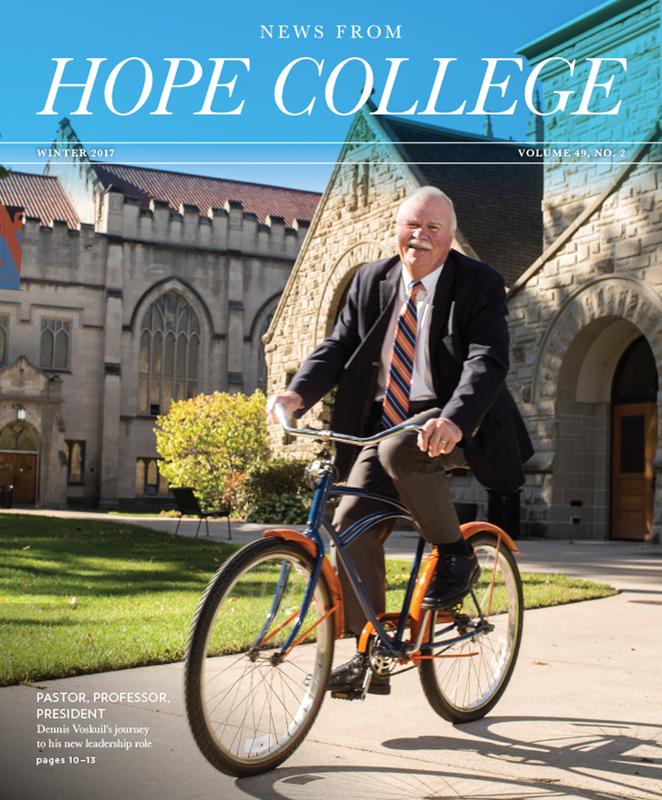 So, the biggest Hope College announcement of the year has happened between when this issue was mailed and when you are reading these words. 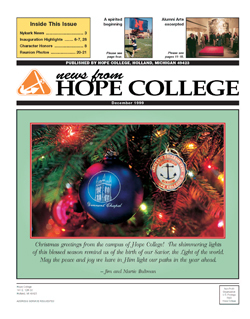 Dec. 7 is (was) when the college plans (planned) to name Hope’s next president, expected to take office in 2019. 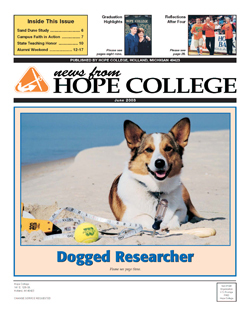 Unfortunately, and much to your editorial staff’s chagrin, this publication’s production schedule is such that we couldn’t include the news in this issue. 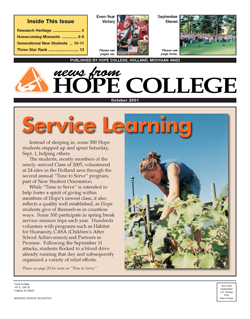 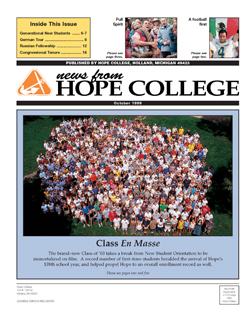 And so, if you haven’t already learned how things turned out via social media, the website, the external media, word of mouth or carrier pigeon, we encourage you to visit the college online at hope.edu/presidentialsearch for the news. 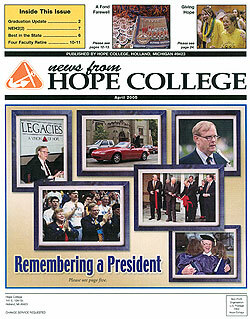 What we can know and share from this limbo-esque vantage point is that there are two possible outcomes: Either Hope’s 14th president has been announced, or the search process is continuing. 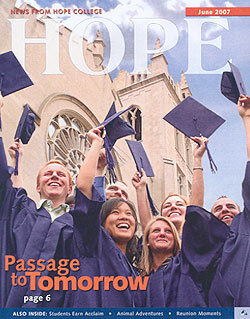 As of this writing, everything’s on track for the former.  From a candidate pool described as “robust,” the Presidential Search Committee interviewed eight semi-finalists on Nov. 2 and 3 and selected three finalists to visit campus on Nov. 15 and 16. 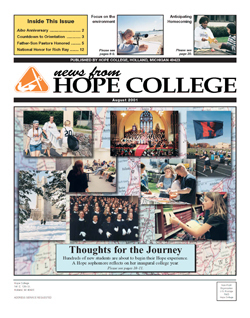 In the weeks that have followed those visits, the committee has reviewed the input of the students, faculty, staff and others who met with the candidates. 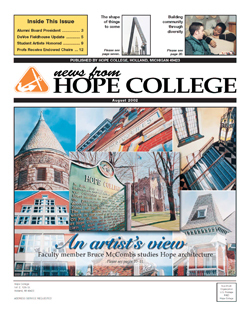 The plan has been for the committee to recommend one of the three to the Board of Trustees, scheduled to vote during the afternoon of Dec. 7. 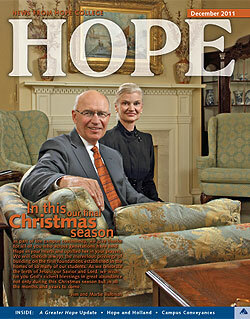 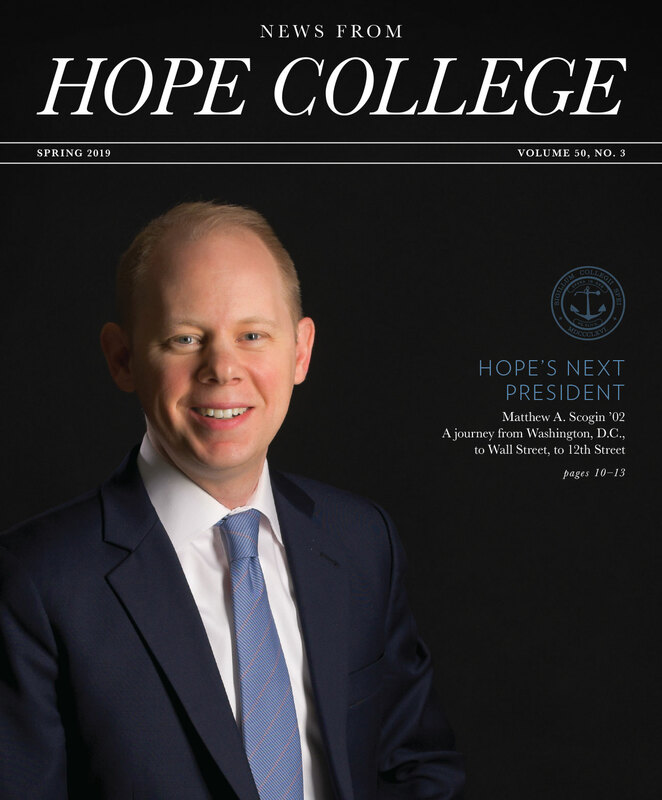 If, as anticipated, the election has resulted in a selection, please look for a feature story about Hope’s next president in the forthcoming spring issue, which will appear in April. 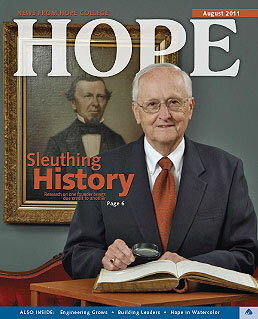 If instead the search will be continuing (as happened in 2012), please anticipate an update about what will happen next. 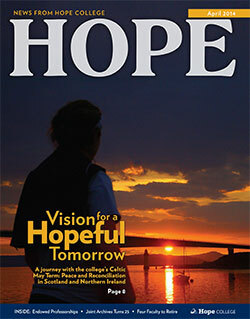 Our prediction on which way things will go? 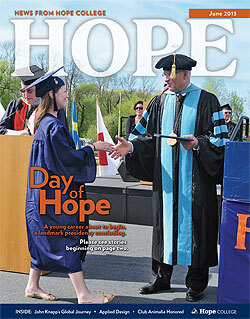 We’ll just end with this: Welcome, Hope’s new president! 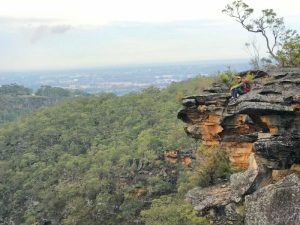 Writing from his semester abroad in Sydney, Australia, junior Bradley Dixon noted that he especially enjoys being in nature. 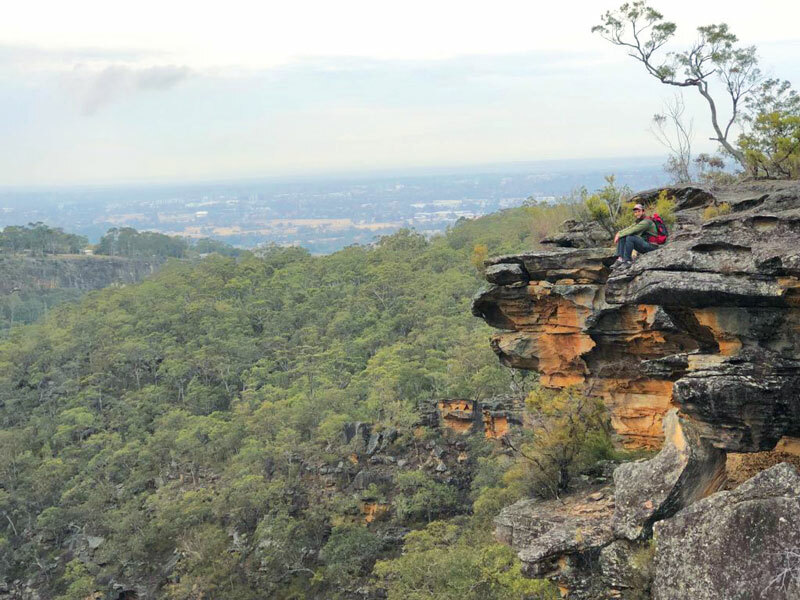 While visiting Kanangra-Boyd National Park, he considered how features remarkable to him would seem commonplace to locals, just as his everyday experiences back home, such as driving on a snow-covered road, would be remarkable to a visitor from Sydney. 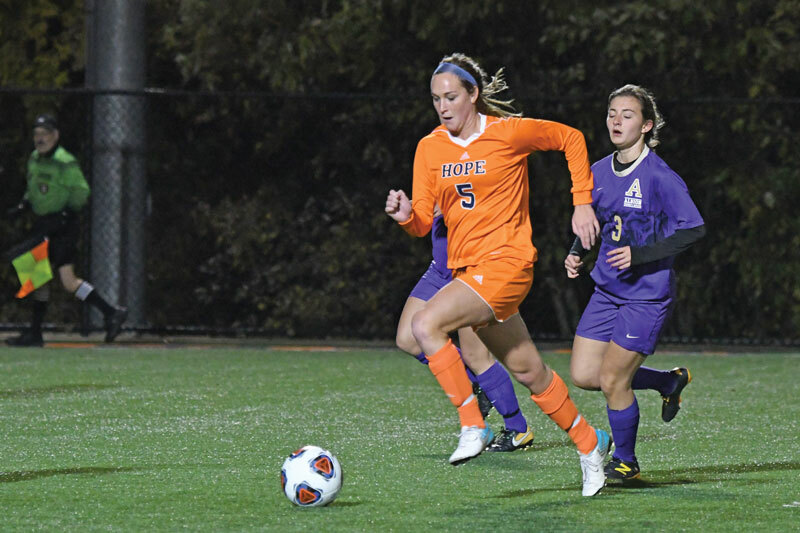 The first NCAA sectional appearance in women’s soccer history and the first four-peat of MIAA league titles in women’s cross country were among the highlights for the 2018 fall season for Hope College Athletics. 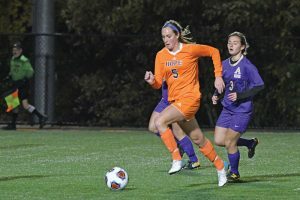 Led by 12 seniors, including MVP Rylie Dalton (pictured), the MIAA-champion women’s soccer team won two matches in the NCAA Tournament before falling to No. 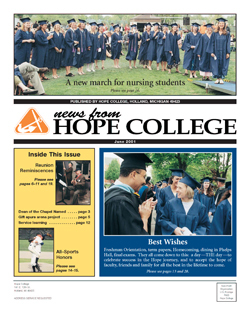 11 Christopher Newport. 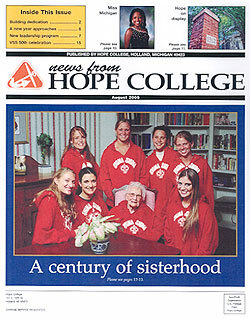 Led by senior Emily Hamilton, the women’s cross country team finished 24th at the NCAA Division III Championships. 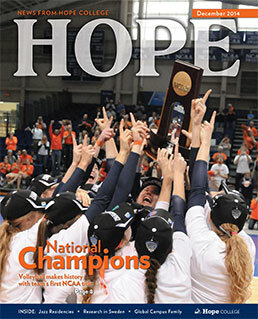 Hope also claimed the MIAA title in men’s golf, with Josh Gibson earning MIAA MVP honors. 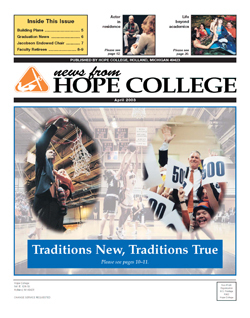 In football, the Flying Dutchmen posted consecutive eight-win seasons for the first time since 1975. 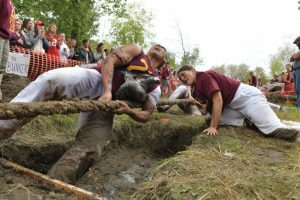 The freshman Class of ’22 and the sophomore Class of ’21 split this year’s traditional fall contests, with the freshmen winning the Nykerk Cup competition and the sophomores winning the Pull tug-of-war. The Pull was held on Saturday, Sept. 22, with the sophomores defeating the freshman Class of ’22 with a gain of 65 feet, 5 inches in a contest that ran the entire three hours. 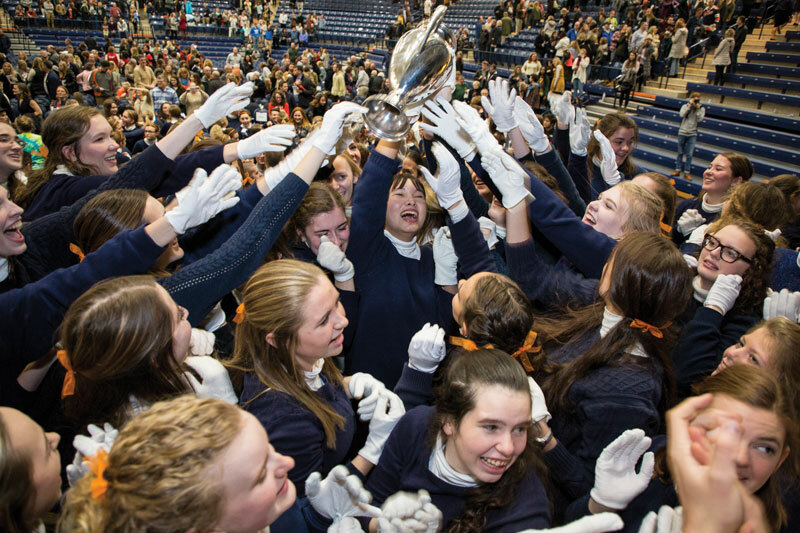 The freshman earned their Nykerk victory on Saturday, Oct. 20, with the event as a part of the college’s combined “Homecoming and Family Weekend: One Big Weekend” celebration. 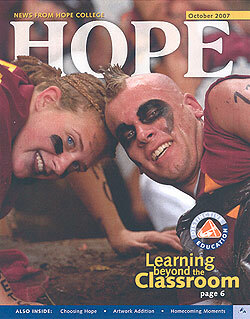 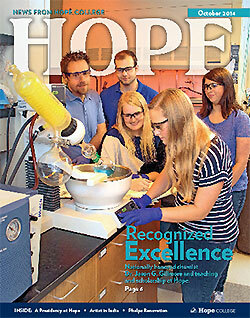 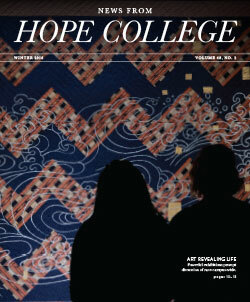 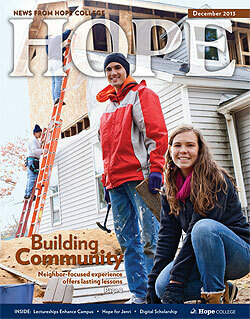 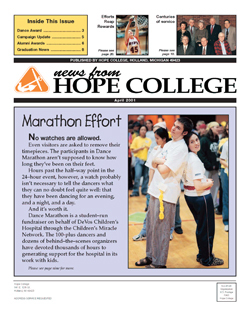 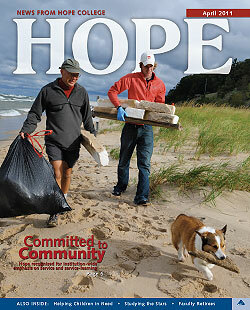 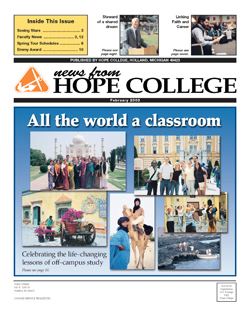 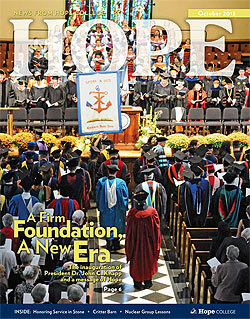 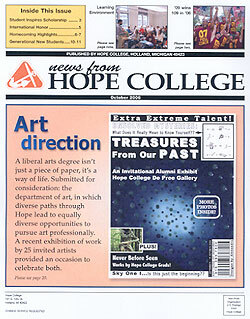 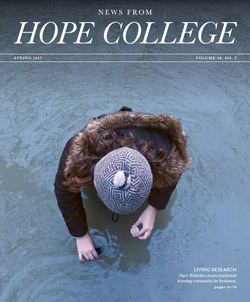 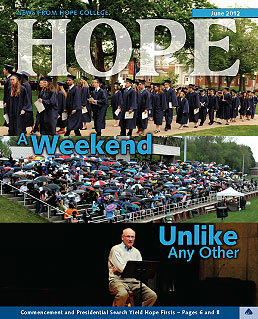 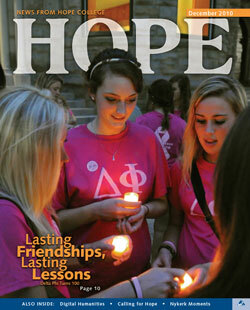 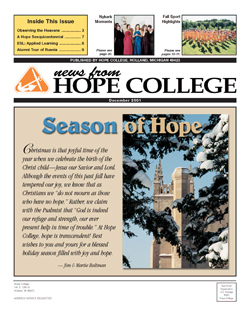 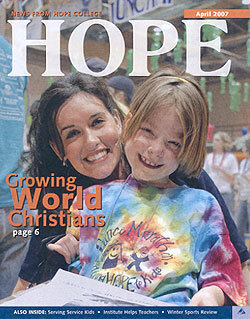 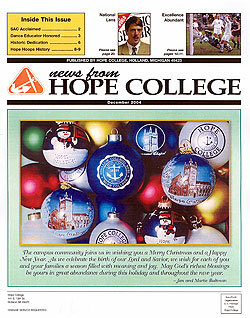 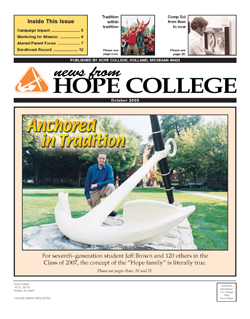 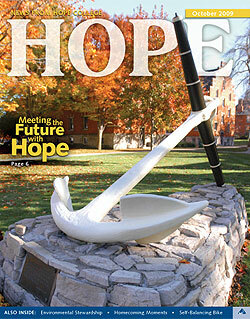 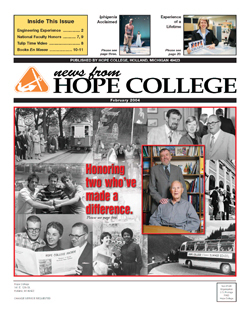 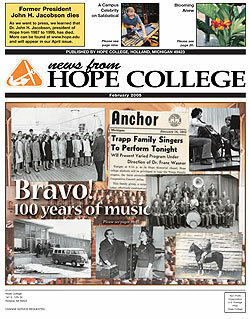 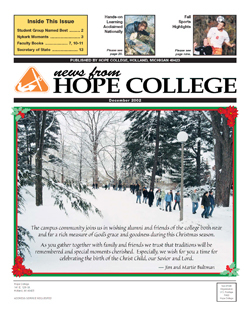 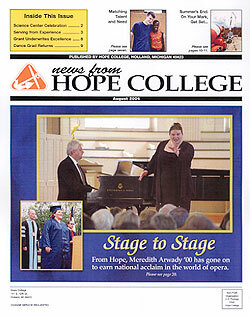 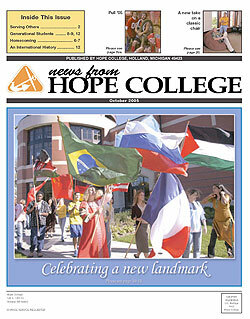 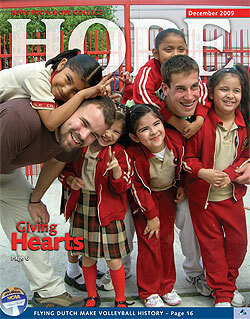 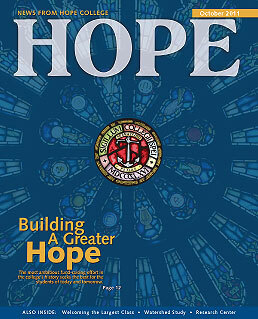 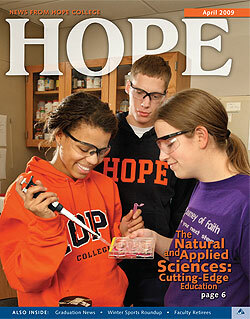 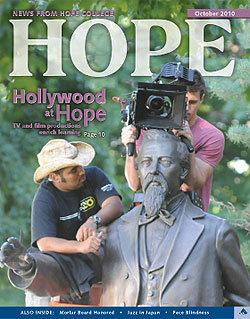 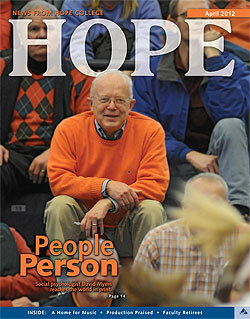 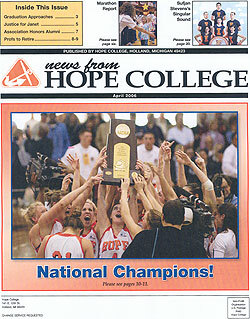 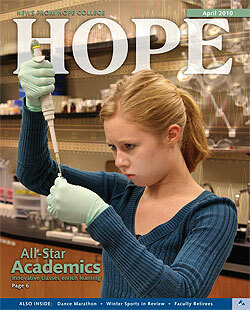 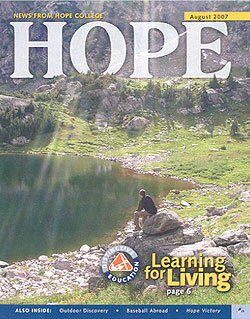 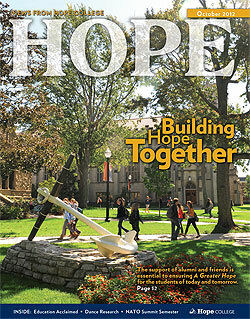 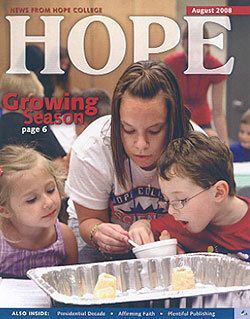 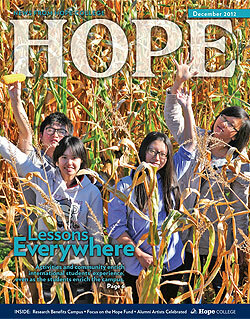 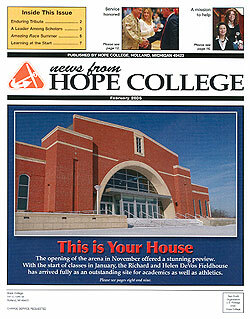 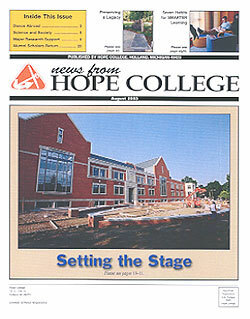 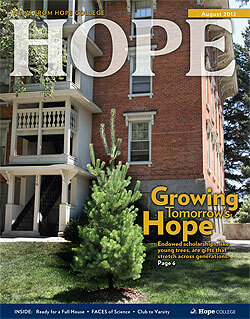 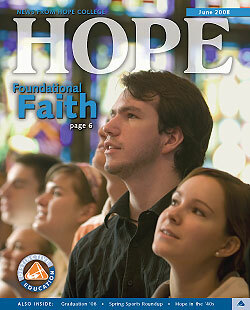 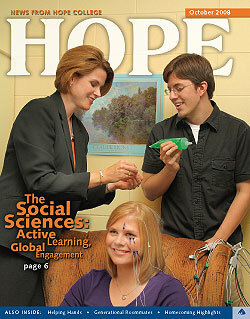 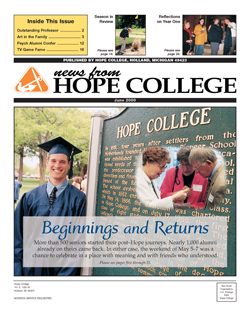 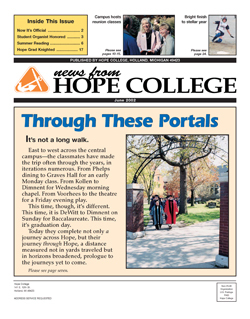 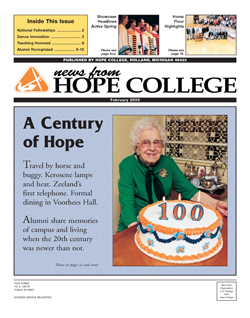 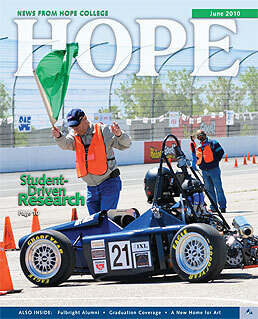 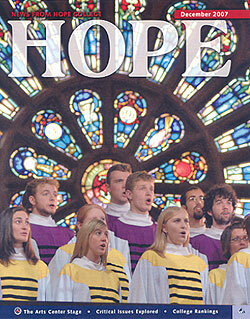 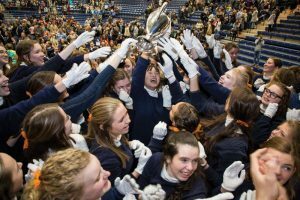 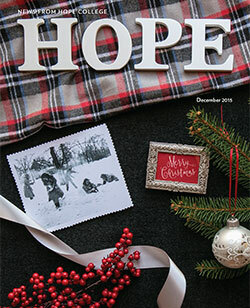 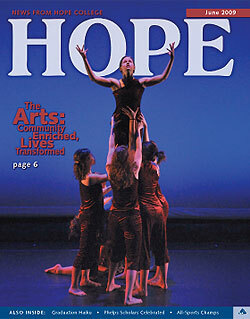 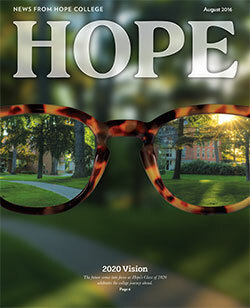 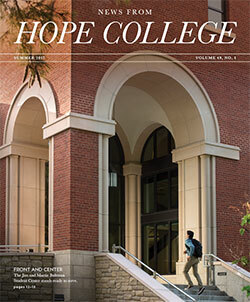 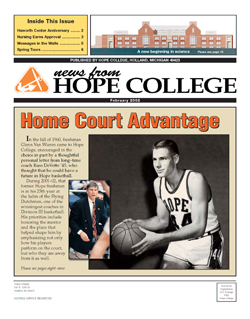 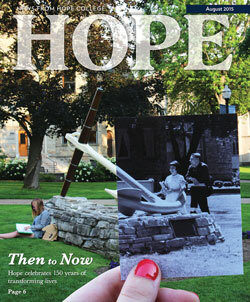 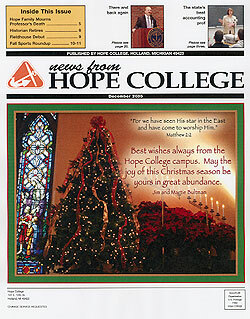 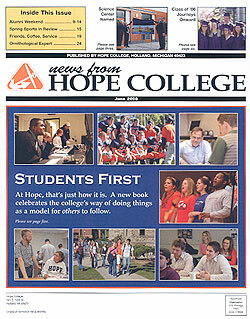 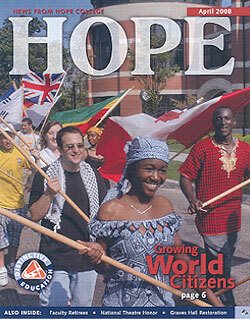 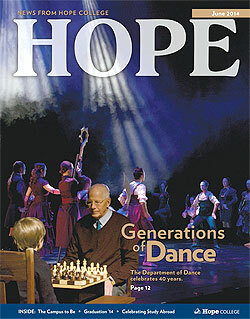 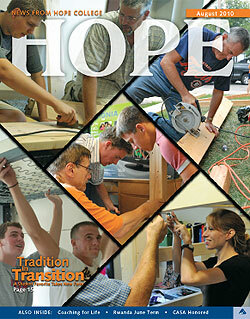 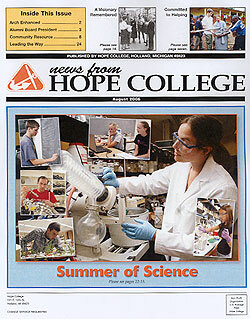 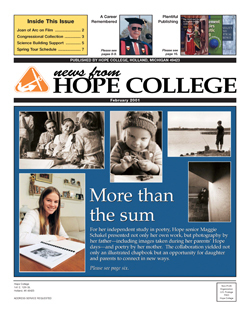 Please visit Hope online for photo galleries of both contests as well as other events in the life of the college. 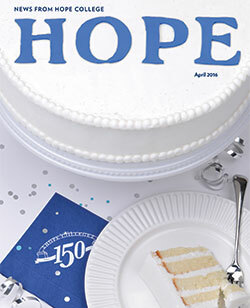 A Commentary on the Minutes of the Classis of Holland, 1848-1876 by Dr. Earl William Kennedy has been published recently by the Van Raalte Press of Hope’s A.C. Van Raalte Institute. 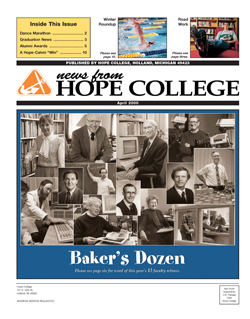 The 28 years that are covered run from Holland’s founding through the last time that the minutes were in Dutch instead of English. 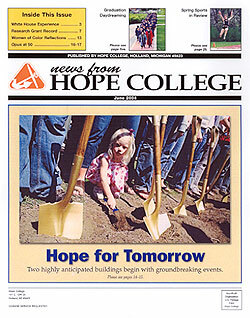 The corridor along the former 12th Street between College and Columbia avenues has been a hive of construction-related activity in recent months, with the college getting its newest transformative project started and neighboring Western Theological Seminary putting the final touches on one of its own. 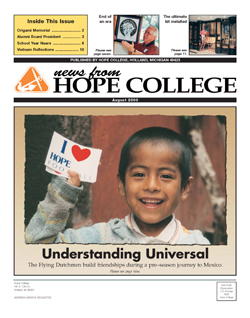 To clear the way for construction of the new Campus Ministries center, Hope moved venerable Fried Cottage two-and-a-half blocks to the southeast in August from its original location at 112 E. 12th St. to Columbia Avenue at 14th Street. 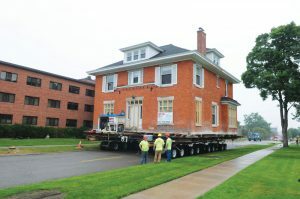 Weeks of preparation preceded the two days during which the two-story, brick structure, which was built in 1898 and weighs 80 tons, made its brief jaunt. 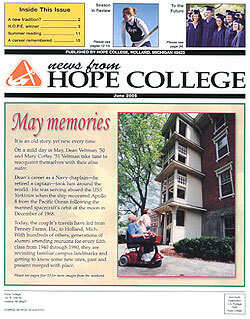 Not every cottage can be relocated (as shown in the summer issue, Delta Phi Cottage was torn down in July), but the college has a long history of moving rather than razing them for new construction, including in the 1970s, 1980s and 1990s for, respectively, the Peale Science Center, the Van Wylen Library, and the Haworth Inn and Conference Center and Cook Hall. 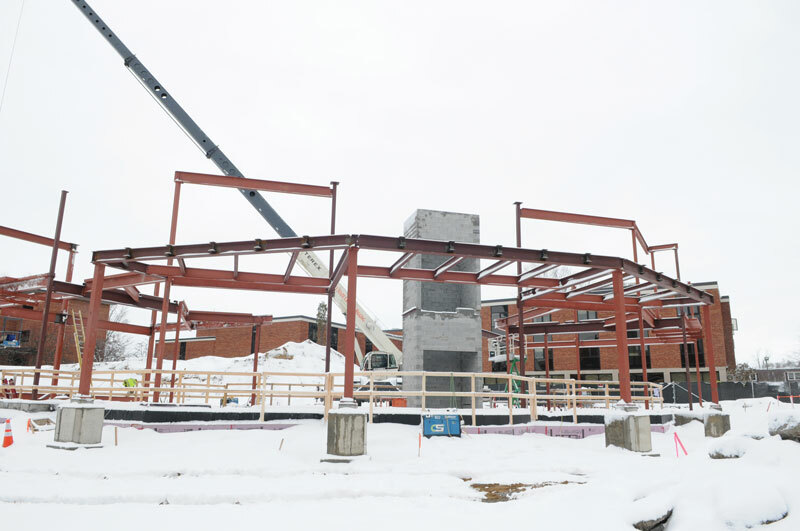 Construction is moving along on the new Campus Ministries center, as shown at left during the last week of November. 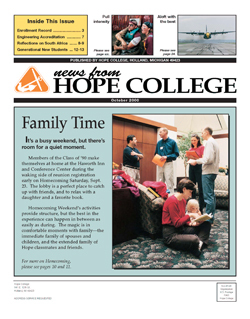 The work began in September following final site preparation, and although there wasn’t a formal groundbreaking event, a brief ceremony following the Chapel service on Oct. 19 as part of “Homecoming and Family Weekend: One Big Weekend” celebrated the project. 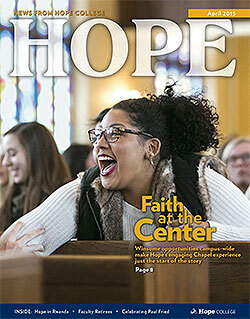 The new center will succeed the Keppel House on 10th Street, which has housed Campus Ministries since 1994 but has become outgrown as programming and student interest have expanded. 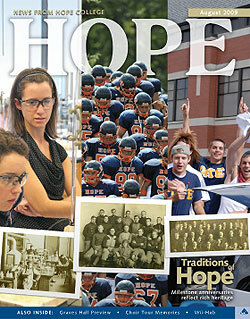 It’s one of three components of the Faith Formation Initiative, a $10 million micro-campaign that is also providing endowment support for a new chaplain in athletics and for other programming. 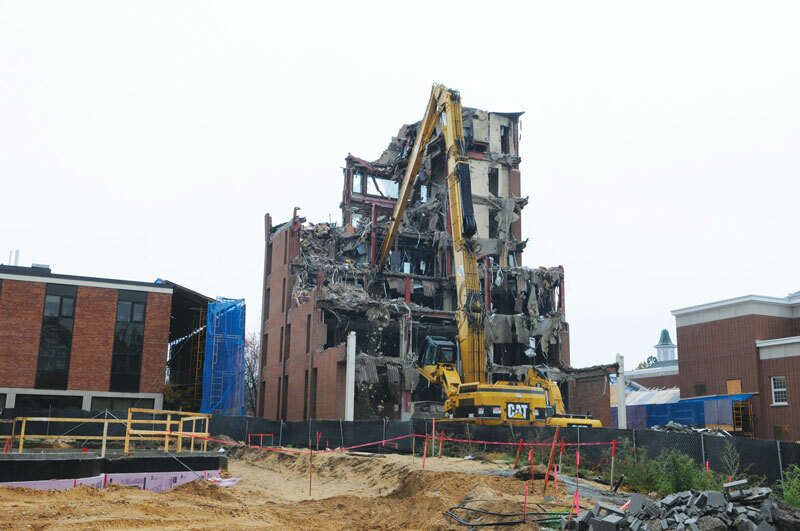 The skyline near campus changed significantly this fall when neighboring Western Theological Seminary demolished its six-story Beardslee Library, which had towered over the area since 1980. 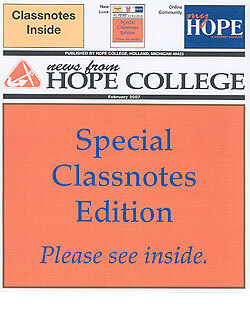 No dramatic implosion was involved. 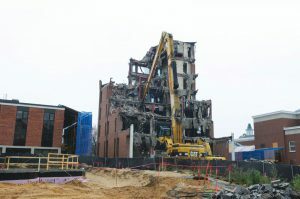 With college residence halls nearby and the rest of the main seminary structure adjacent, the building was carefully disassembled level by level. 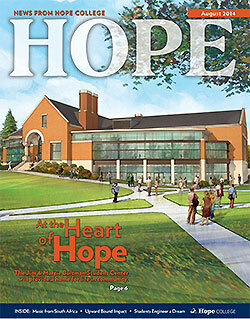 The project was part of the seminary’s $25 million Our New Day campaign, which has included not only replacing the library, but extensive new construction and renovation, as well as support for the seminary’s endowment. Construction began in the spring of 2017.